rootoftwo is a hybrid design studio co-directed by John Marshall and Cezanne Charles, that makes hybrid design projects, social objects, experiences, and works for the public realm – typically at the scale of devices, furniture or small buildings. Their experimental objects and experiences attempt to disrupt and expose existing systems of social behaviour through humour, play, interaction and participation. Humour is particularly important, where laughter is as much about coping with discomfort, embarrassment or confusion as it is about expressing joy, happiness or relief. 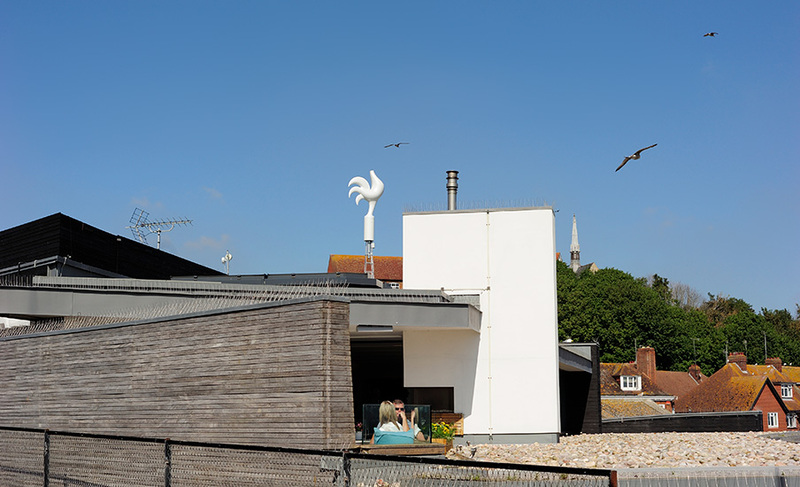 For Folkestone Triennial 2014, rootoftwo has created Whithervanes, a Neurotic Early Worrying System (NEWS) consisting of a network of sculptures in the form of five headless chickens, to be presented on the highest points of five buildings. The buildings have been selected for their prominence and significance to the community in which they are placed, as well as for their height. 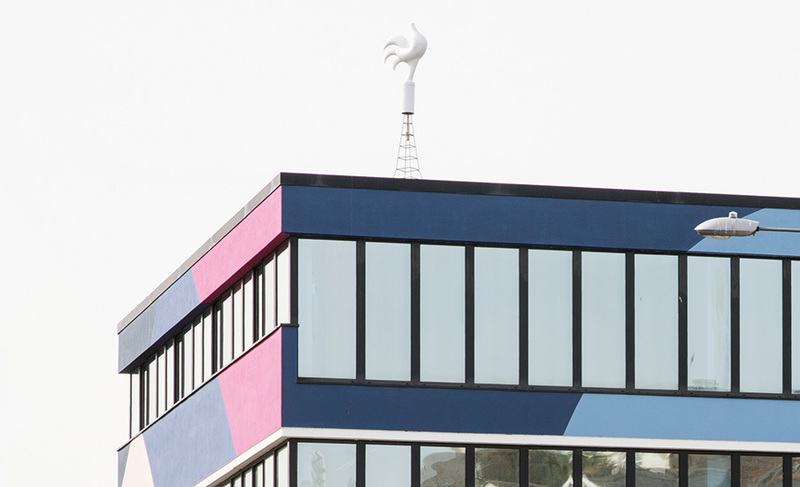 The Whithervanes, weathervanes for the twenty-first century, will track and measure the production of fear on the internet. Their software looks for predetermined keywords related to fear (e.g. natural disaster, economic collapse, war, etc.) in newsfeeds from Reuters. The keywords have been generated in part from the people of Folkestone through community engagement workshops, and also from the 2011 US Department of Homeland Security Media Monitoring Capability Analysts Desktop Binder. When fear is encountered, the chickens respond by rotating at increasing speeds and are illuminated in different colours. They share real time news-feed data from around the world and passers-by will be able to influence their behaviour via Twitter. This ‘early worrying system’ highlights how much our contemporary media, policy and political frameworks utilize fear as a persuasive method. John Marshall was born in 1971 in the UK and Cezanne Charles was born in 1973 in the USA. rootoftwo is based in metropolitan Detroit.